I interrupt our regular programming with a recipe post. 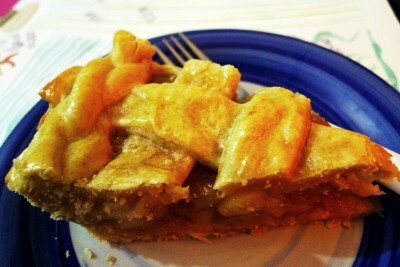 Since cheesecake is too simple and widespread to even have to write a recipe, I shall share the apple pie one. 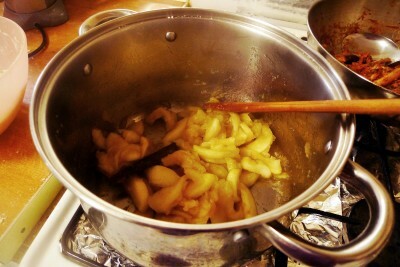 Mama’s apple pie is baked in the oven, while the filling is cooked on the stove beforehand. Some other pie recipes may differ from this method. A slice of the final product. First, I thought I’d share something funny: like all students living overseas wishing to relieve their cravings for home food, recipes are obtained from dearest mummy via chat or call. 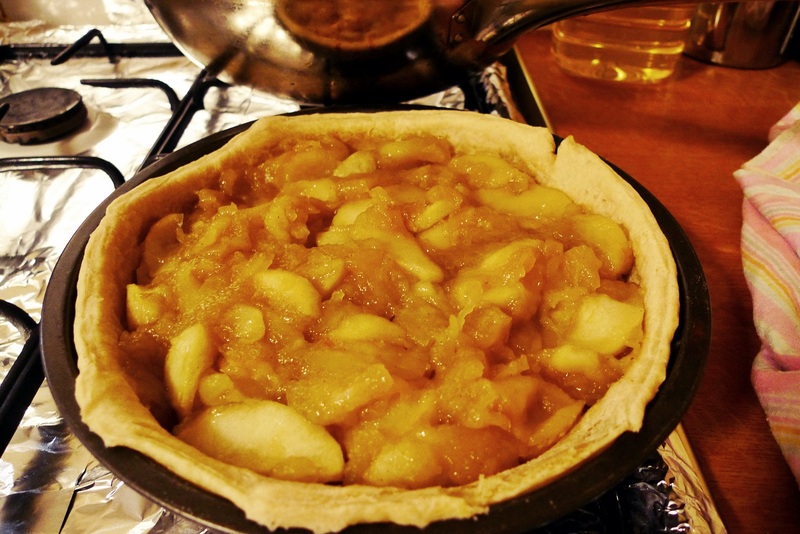 Up till this point, the apple pie recipe remained in the form of a plain text file named “applepie.txt”. Fancy, I know. 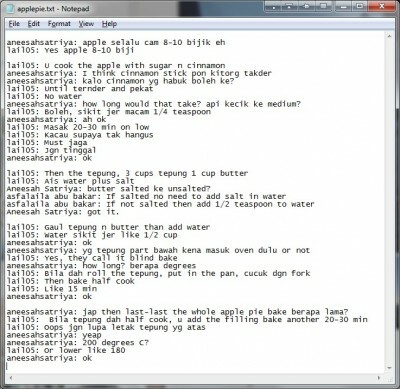 Ze abridged Yahoo Messenger chat! Since I was too lazy to photograph the individual ingredients, let’s just jump into the steps. I’ll caption the amounts along the way. For an average 8-9 inch pie, you will need 8-10 Granny Smith apples. 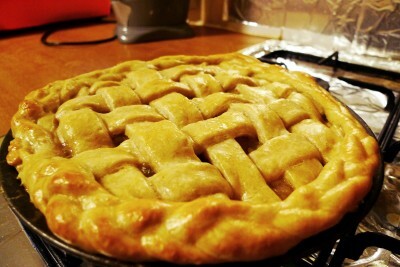 I only had six apples so the pie was rather small. 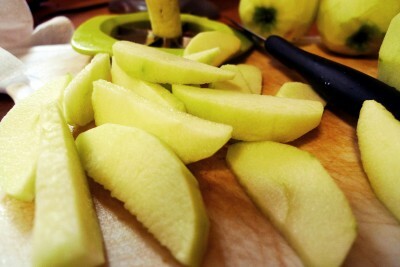 Peel with a peeler or knife. Then core them with a thingamabob or manually with a knife. 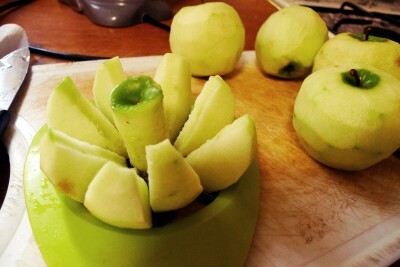 This apple corer split the apple into eight wedges. Then slice each wedge in half, to make them thinner. In other words, one apple now makes 16 wedges. I don’t really know of the logic behind cutting apples into thin wedges rather than cubes or smaller pieces, but Mama has always done them this way so I assume it is a necessity. 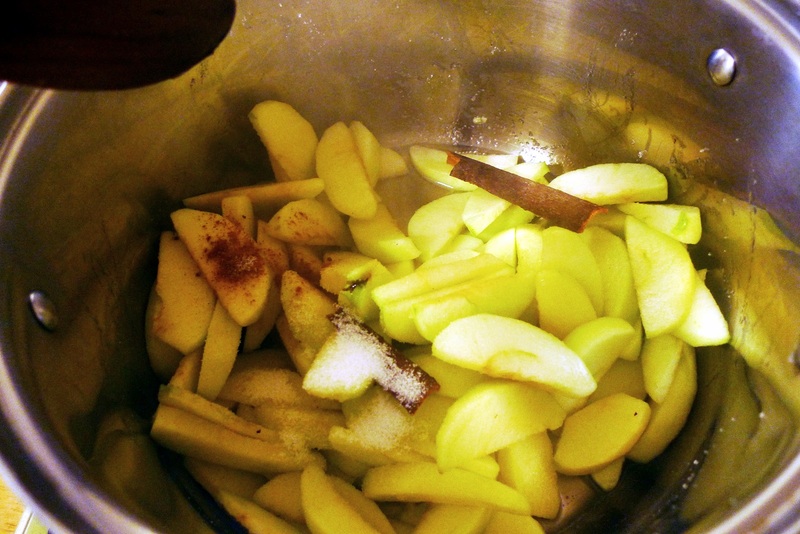 In a pan on low heat, cook the apples with some cinnamon (one cinnamon stick, or a 1/4 teaspoon of ground cinnamon. I put both this time ) and white sugar. 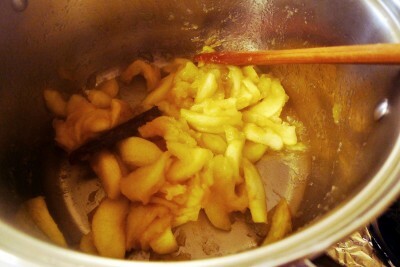 The amount of sugar really depends on the apples, but I think it is never more than 3/4 cup for 8-10 apples. Having too sweet of a filling isn’t our goal. As Mama noted in her chat message, you have to keep stirring the apples on low heat, please don’t just leave them to burn. At some point they may become watery from the sugar but keep stirring at regular intervals for about 30 minutes until they become tender and thick. 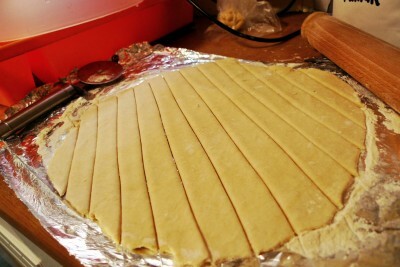 In the meantime, make the shortcrust pastry. You can always buy pre-made pastry but Mama never did that. So it’s 3 cups flour with 1 cup salted butter. 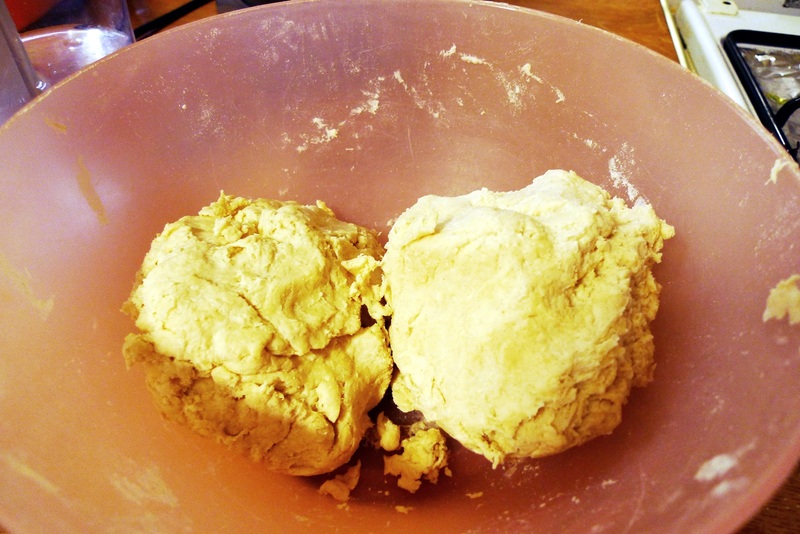 (If you have unsalted butter, just add 1/2 teaspoon of salt into the dough as well.) I like to grate the butter with a cheese grater to “cut” it into small pieces. Then just use your hands to rub the butter into the flour. 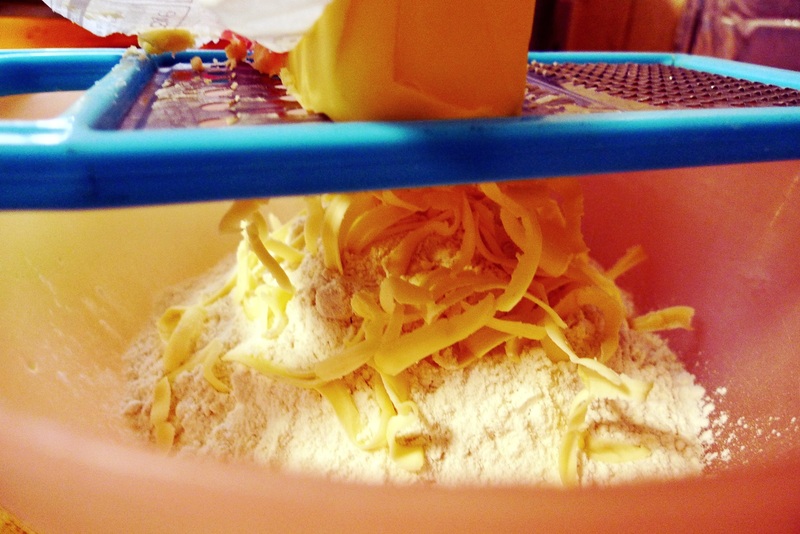 The flour will become quite yellow and crumbly. Then you will need ice-cold water, around half a cup. 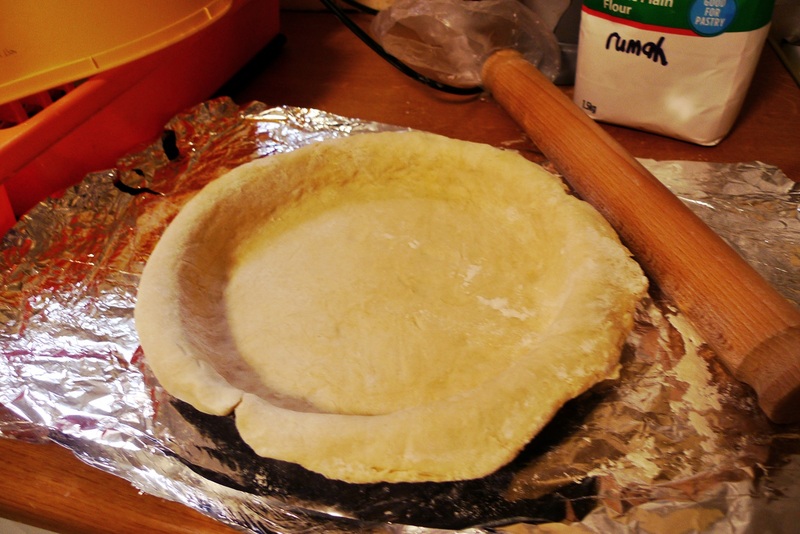 Make a hole in the middle of the dough and pour some of the water. 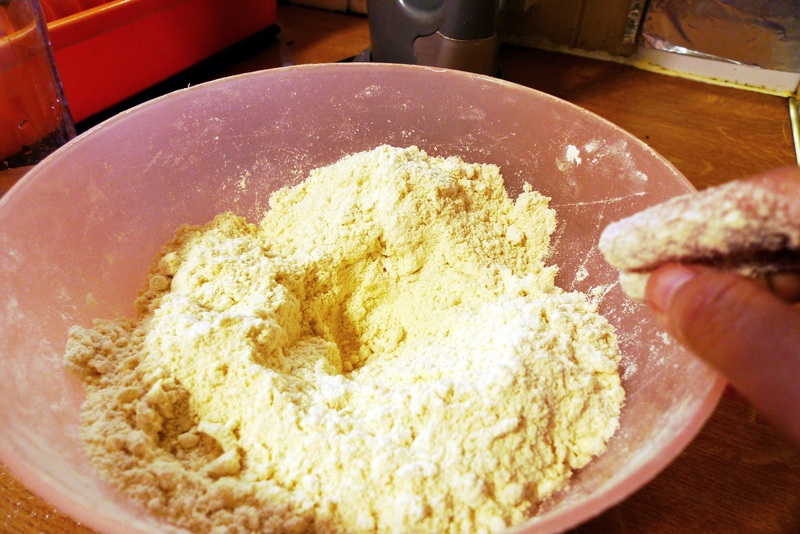 Gather the flour together until it sticks to itself into a ball. The trick with shortcrust pastry is not to handle it too much after adding water — it might become bready/tough otherwise. Split the ball into two and keep them in the fridge (I use separate plastic sandwich bags) for at least 15 minutes. By this time, your filling should probably be done. Turn off the heat and let it cool for a bit. Discard the cinnamon stick (if used). This is my greased pie dish. 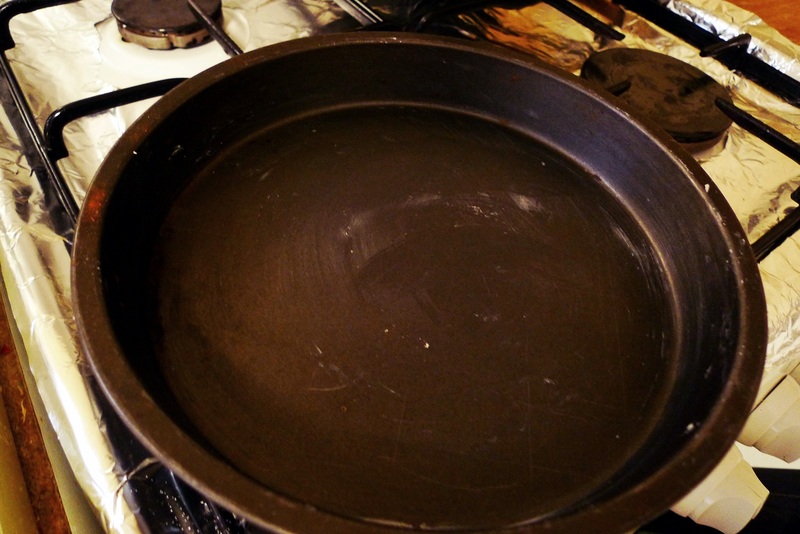 Any kind of ceramic/metal oven-safe dish is OK, it doesn’t have to be very deep either. I’ve also done mini-pies before in like tart dishes but they take more work. Preheat your oven to 180°C. Take out just one ball of dough from the fridge and roll it out on a clean and floured surface. Flour your rolling pin as well. The thickness should be about 1/4 inch or slightly less. 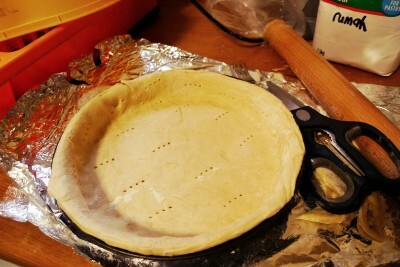 The diameter needs to be as big as your pie dish including the sides. 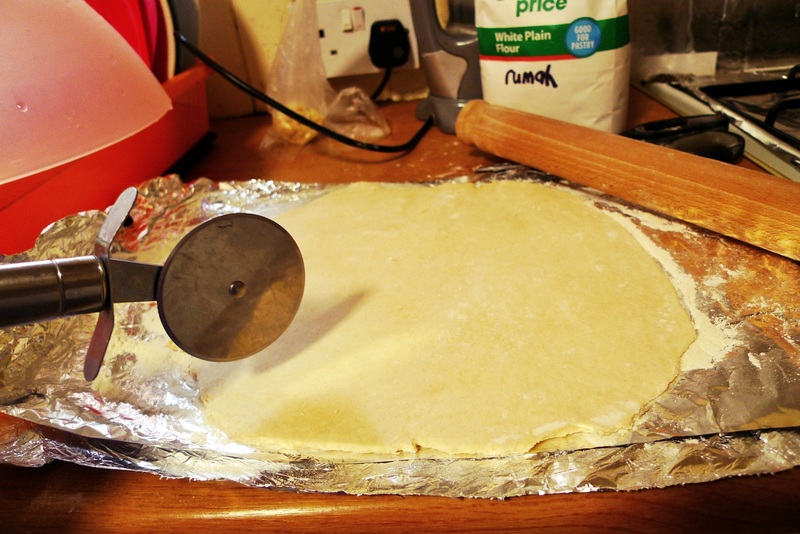 Lay the dough onto your pie dish (there’s a trick to lift the sheet using the rolling pin… it’s probably Googlable) and press neatly to fit. 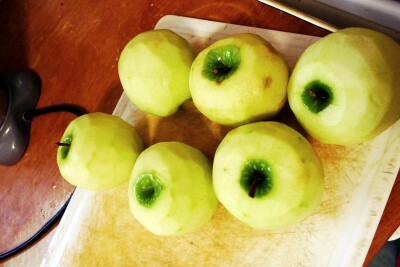 Cut off the excess around the edge and prick all around with a fork. You will need to blind bake this bottom dough for about 15 minutes. Some people use weights (or beans or rice) to prevent the dough from bubbling up in the oven but I’ve never bothered. 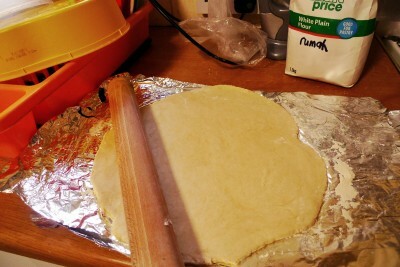 While the base is in the oven, roll out the other ball of dough to make the top pastry. You can do a simple all-over cover (just make sure to cut some shapes out of the dough to allow steam to escape while it’s baking), but I’m going to make a criss-cross woven lattice thingy. So I use a pizza cutter to cut even strips out of it. Once your pastry base is half-cooked, fill the pie. I use an eggwash (one cracked egg with some water or milk to dilute it) to glue the top to the pie sides and where the strips overlap. Mama actually never wove the strips over and under, instead — the horizontal strips just laid on top of the vertical ones all across the pie. Same difference really. You can also brush the egg all over to make the pastry shiny. I also wove a braid to neaten the edge of the pie and to give it a bit of a “pizza crust” holder. 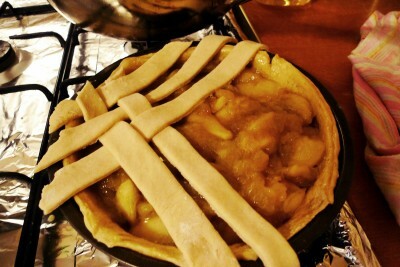 Then pop the pie in the oven for another 20-30 minutes until crispy and golden. Leave it out to cool for a bit, then cut and serve! I actually like to eat this using my hand, like a pizza slice. Bahahaha. Just browsing through some links on an old copy of my site and fancy that, you’re still blogging! Hi Jem! So good to hear from you! Funny you mentioned the butter trick — I have recently just purchased a pastry blender (also called pastry cutter), it’s a handheld grippy thing with a few blunt blades to be used to cut the butter into flour as well. Have used it once and works great, so there’s another alternative to the grating method if you’d like to try. Hi where did you buy the pastry blender? Hi Mel, I bought it at Fenwick, a local department store.